President Vladimir Putin, in a conversation with Moscow Mayor Sergei Sobyanin, has suggested demolishing a Kremlin administrative building and restoring two Orthodox monasteries. Would this demolition damage the Kremlin’s architectural synthesis and could the monasteries that were destroyed in 1930 be adequately recreated? Demolition order for recent history? Building 14 is a relatively recent addition to the Kremlin ensemble. It was built by the architect Ivan Rerberg in 1934 on the site of two monasteries – the Chudov and the Ascension – that were demolished in 1929 and 1930. Many churches were blown up at that time all over Russia as the government sought to do away with Orthodox houses of worship and imagery, which were incompatible with the communist ideology of the new state. Originally, major repairs were planned for the building. However, the president is now convinced that demolition will be more expedient than renovation. The administrative building has a rather short, but rich, history. In the 1930s it housed a Military College; however, it soon moved to a more spacious location and the Secretariat of the Presidium of the Supreme Soviet was located there in the 1930s. In 1958, part of the building was even rebuilt as part of the Kremlin Theater, but the building was not equipped for large events from the very beginning; moreover it was located in the Kremlin’s administrative zone, which made receiving large numbers of spectators more difficult. So in 1961 the idea was rejected. At the end of the Soviet period in 1991, then-president Mikhail Gorbachev allocated part of the building to Boris Yeltsin, who shortly thereafter was elected president of the Russian Federation (then within the framework of the Soviet Union). After the collapse of the USSR, Building 14 returned to the spotlight – Russian presidents’ press conferences were held there periodically through 2008. In itself, the demolition of the building does not arouse any particular objections (it is not an architectural monument). However, the overall appearance of the Kremlin – which is on the UNESCO World Heritage List – may suffer. “For now, only the decision to suspend the renovation has been made. But for a demolition an agreement will have made with UNESCO,” Spokesman for the Office of Presidential Affairs Viktor Khrekov told RBTH. Can the exact look of the ancient monasteries be recreated? Rustam Rakhmatullin, coordinator at architectural watchdog Arhnadzor, believes there is not enough information available (the architectural plans have not been preserved) and a modern copy of a historical building will be the result, i.e. it will be an inaccurate and historically unverified copy. The renowned architect Mikhail Leikin agrees with his colleagues, but provided an example of a successfully restored church – the Cathedral of Our Lady of Kazan on Red Square – in a conversation with an RBTH reporter. The church in question was demolished in 1936 and rebuilt in 1990-1993. The Chudov and Ascension monasteries were among Russia’s most ancient; they were founded in 1365 and 1386. However, they were destroyed and rebuilt many times, so they lost their original appearance. A number of architects have supported the idea of restoring the monasteries based on the many photographs which have been preserved. “This is absolutely realistic and there is nothing difficult about it – even if there won’t be a perfect resemblance,” said Vice President of the Union of Architects of Moscow, Alexei Bavykin. Viktor Khrekov provided assurances that even if UNESCO approves the demolition of the administrative building, the construction of monasteries will not begin immediately: "If an agreement is reached with UNESCO, we will initiate a broad-based discussion with the expert representatives from the Union of Architects, organizations for the protection of monuments, and museum staff," he said. No one knows yet how to react to the president’s words. The demolition of the building will either happen or it won’t (it depends on UNESCO), and the monasteries will either be restored or not (this question is still in the very early stages of discussion). There is also the alternative option of creating an architectural park in the location of the demolished building (if it is indeed demolished), by cleaning up the remains of the ancient foundations of the two monasteries. Meanwhile, a section of the Kremlin that was previously accessible to the general public will now be removed from the list of sensitive sites. In late July the Kremlin took the decision to open the Spasskaya Tower gate to tourists; previously only presidential corteges and the Kremlin’s New Year tree were allowed through it. 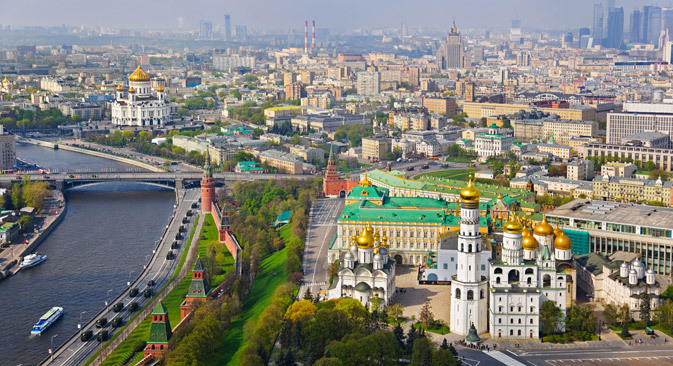 Kremlin Commandant Sergei Khlebnikov recently said that the section between the Borovitskaya and Tainitskaya towers will become open to visitors. The Kremlin “is releasing” a piece of territory and changing its status from that of sensitive location to tourist site.